It’s easier than you think, but you can get all the benefits for this low price. Simply listen to the Food as Fuel Hypnosis MP3 every night as you go to bed for three weeks and feel the changes happening in your life. You will feel more empowered, more in touch with your true self, and you will truly know that your goals are within your reach. Steve G. Jones achieves AMAZING and LASTING results!!! Hypnosis is the easiest way to affect change in your life because the positive messages go straight to your subconscious mind effortlessly so you can accomplish your goals and reach for the stars!! 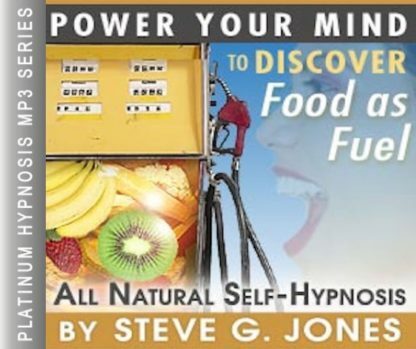 All you have to do is listen to the Food as Fuel Hypnosis MP3 session at night as you go to sleep!!! You’ll hear soft music, the gentle sounds of the beach, and the soothing sound of Steve G. Jones’ voice all working together to bring about positive changes in your life easily and naturally. Steve G. Jones has been helping people improve their lives with hypnosis for over 17 years…now it’s time for him to help YOU… don’t wait, do it NOW !!! you’ll be glad you did. See you at the top! I am a major supporter of healthy living. I think that the foods you put in your body have an impact on how you feel on the inside, mentally and physically. I believe in using the food as fuel approach. In other words, the foods that you eat should serve a purpose in giving you the vitamins, nutrients, and satisfaction to get through your day. Certain foods do not provide vitamins, nutrients, or lasting satisfaction. We all know which foods these are: junk food such as candy, chips, cookies, and crackers. These foods do not provide fuel for our body. Food that keeps you satisfied for longer such as protein and fiber will keep you from turning to junk food when you get hungry. A great way to fill up and feel like you are eating a lot is eating vegetables. I encourage you to find vegetables that you like! And if that sweet tooth starts acting up, a great way to satisfy it is with fruit. Fruit is sweet and it has a lot of good vitamins and nutrients that you can’t get from other sweets. I encourage you to discover food as fuel! You are now completely relaxed and at ease. I want you to picture your body as an engine. You know that the more you drive, the more gasoline you need. Our bodies are similar to an engine, the more we use our bodies, the more food it needs. If you are always on the go, moving around, exercising, and very active, you are going to need more food than someone who sits at a desk most of the day and doesn’t move their body a lot. Just like an engine needs gasoline, we need the proper sources of food to keep us going. You wouldn’t put water, juice, or coffee in your car, your car wouldn’t run properly or at all. You must eat healthy foods in order to be healthy, mentally sharp, and have enough energy to get you through the day. In order to use food as fuel, you must eat lean protein, whole grains, vegetables, and fruits. These are the best foods to get all the nutrients and minerals your body needs for optimal health. Lean proteins are fish, poultry, beans, nuts, and soy. They are all high in protein and protein will keep you satisfied for a long period of time. Protein stays in your body and gives you the energy you need so that you feel good throughout the day. Whole grains are important because they are an excellent source of carbohydrates. Carbohydrates also give you energy, but this energy is like short term energy. It won’t stay with you for a long period of time, but it will give you more of an instant boost. It’s very important to balance protein and carbohydrates, both are very important. You will want to eat whole grains because they have fiber in them. Fiber is the part in carbohydrates that keeps you satisfied longer. Fiber is a very important part of your diet and keeps your healthy. Vegetables and fruits are important because they contain so many valuable nutrients. Protein and carbohydrates will get you through your day, but vegetables and fruits will give you the vitamins and nutrients to sustain a long and healthy life. The more brightly colored the fruits and vegetables are the better. This means that they are rich in antioxidants and vitamins. You should also strive to eat dark leafy greens. They also provide many nutrients that you cannot get anywhere else. Picture yourself eating these foods. You eat lean protein, whole grains, vegetables, and fruits. You are able to have the energy you need throughout the day. Whether you are training for a marathon or chasing your children around the house or spending 9 hours at work, you need proper nutrition. What you put into your body has a direct effect on how your body feels, thinks, and performs. You will feel satisfied and energetic with the right foods. By getting rid of fried foods and saturated fats you will feel better throughout your day and you will notice changes long-term. You may not notice a change right away in your mental capability, but using the correct food to nourish your body will have a drastic effect on your mental health in the long run. Perhaps a lifetime of eating right can help fight against Alzheimer’s Disease and different cancers. Getting the right nutrition will also affect how your body performs in the short-term and long-term. You will feel like you are in better shape if you are consuming the right foods in the short term. In the long-term, the correct foods will help you keep your bones, joints, and muscles in good working order so that you can be mobile as you age. You have complete control over what foods you consume, which means you have a lot of control over how your body and mind think, feel, and perform. Food is what fuels your body. The food that you put into your body has a direct effect on how your body performs and feels. You can enhance and change the way you eat by listening to the Food as Fuel Hypnosis MP3 audio. This hypnotherapy session will encourage you to eat the foods that will give you fuel for life. Fueling your body is not just about eating the right foods, it’s eating the right portion and percentage in your daily intake. You can change the way you see food with this powerful hypnotherapy program. You will want to only eat the foods that provide good energy and healthy nutrients to your body. The powerful and positive suggestions will change your outlook on food. You will no longer want to eat the foods that are bad for you and do not give you fuel. You will notice great changes in the way you eat and the way you feel when you begin listening to this Food as Fuel Hypnosis MP3 download. We suggest that you listen to it for 21 nights before going to bed. You will be in a relaxed state of hypnosis, allowing the suggestions of the session begin to reprogram your mind to eat the right foods.